ACT Research Co. said June orders hit 42,200, up 133% from a year earlier when orders were 18,104. ACT cited preliminary data it will fine tune when final figures are out later in July. “The swelling backlogs are the manifestation of all the underlying demand — the economy and the strength in freight, the capacity crunch. All those good things,” ACT Vice President Steve Tam told Transport Topics. North American Class 8 production could become the fifth-highest ever, if it stays on track, he said. Given all the production issues, ACT has cut its production outlook for this year by 8,200 units to 316,000. It forecasts production to rise to 334,000 next year, which would be the third-highest ever. At the same time, Daimler Trucks North America, which had acknowledged supply chain issues recently with its proprietary axle, now believes things are improving. “More recently, we have begun seeing these constraints lifting and an overall improvement of the situation,” according to a company statement. The research firm FTR pegged June’s orders at 21,800. 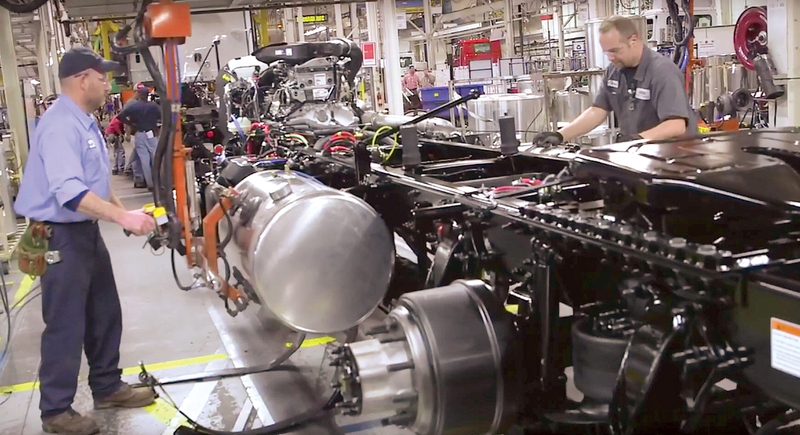 “Fleets are flooding truck makers with orders. The thought is get them in the backlog now. Just throw them out there,” said Don Ake, vice president of commercial vehicles for FTR. “It’s human nature. This is how humans react to a shortage situation. It’s rational and emotional all wrapped up into one,” he said. One motor carrier executive said the company placed orders for next year in June, which was earlier than ever before. “I have been here 18 years and I can’t think of another one where we placed our order this early. Normally, it’s mid- to late-October,” said Robert Ragan, chief financial officer of Melton Truck Lines Inc.
Part of it is order boards are filling up, he added. Pricing was a concern, too, for the Tulsa, Okla.-based flatbed carrier with 1,300 Class 8 trucks. “With the recent news and actual implementation of tariffs, we were afraid that would cause some volatility in commodity prices, therefore increasing our truck cost next year. So we went ahead and locked up our deal with Kenworth in June,” Ragan said. Melton ordered 420 trucks, primarily from Kenworth Truck Co., a unit of Paccar Inc.
“We are very confident business is going to remain, maybe not at this level, but remain decent through 2019,” Ragan said. I have been here 18 years and I can’t think of another one where we placed our order this early. Robert Ragan, Melton Truck Lines Inc.
At the same time, one supply chain consulting firm noted the capacity crunch has some companies starting or building out their own private fleets. “Shippers have found that it is much harder than in the past to rely on the common carrier market and this has caused several to invest in expanding or adding a private fleet,” said Eric Grice, project manager at enVista. What those companies had not expected was the difficulty in obtaining new Class 8 trucks, he said, adding that having new equipment can be vital to a shipper’s own supply chain. “Also, given the rise in fuel costs and continuing improvements with fuel efficiency in new Class 8s, the cost delta between what they would have to continue using until their new tractors come in is certainly not insignificant,” he said. Production slots, with some limited exceptions in the fourth quarter, are filled for this year, said Robert Gomez, executive vice president of sales at Worldwide Equipment Inc.
Gomez said Prestonsburg, Ky.-based Worldwide placed larger-than-normal orders in June for customers wanting the Mack Trucks, Volvo Trucks North America and Kenworth Truck Co. brands it carries — all for first-quarter delivery. Mack and VTNA are units of Volvo Group. Worldwide is scheduled to place a similarly large order for its stock trucks in July, allowing that upfitted vocational equipment to be ready for sale by March, he said. Meanwhile, Gomez suggested supply chain issues may have started to spill over into the repair side, too.